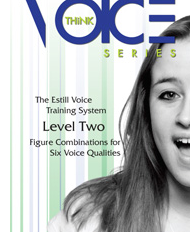 The Estill Voice Model has 3 components: Craft, Artistry, Metaphysics. Craft is learning how to control the various structures that help determine voice quality. Control of these structures leads to unlimited options for changing – or maintaining – voice quality, without vocal strain. Craft is the foundation and is taught in Levels 1 & 2. Artistry requires knowledge and demonstration of the stylistic elements of a performance. Metaphysics or Performance Magic encompasses the indescribable experience of becoming one with your audience. Having a strong foundation of Craft and Artistry improves your chances of experiencing performance magic, finding that “zone” more frequently. In Level 1, control of the structures involved in voicing is taught : False Vocal Folds, True Vocal Folds, Thyroid Cartilage, Cricoid Cartilage, Larynx, Velum, Tongue, Aryepiglottic Sphincter, Jaw, Lips, Head/Neck and Torso Anchoring. Effort is continually localised and monitored. Development of kinaesthetic awareness is an important part of Level 1. The six basic Voice Qualities, each consisting of a combination of the Figures, can be modified to produce any desirable vocal sound: Speech, Falsetto, Twang, Sob, Opera, Belting. 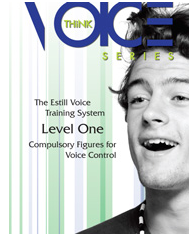 Course attendance includes two comprehensive manuals, one for each level. The manuals have detailed anatomical diagrams and clear explanations of each Figure and Quality including training exercises for developing competence. Included in the manuals are descriptions of the Voiceprint Acoustic Program and how the spectrogram shows changes in frequency and harmonics. Jenny presents the Estill Course in an easily understandable manner, and encourages you to develop your kinaesthetic awareness at every opportunity. An extremely informative and valuable course for anyone who uses their voice.